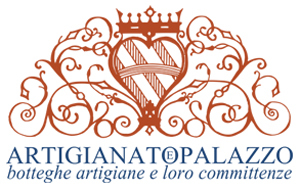 Their contribution was of great help to the organization of the 23rd edition of ARTIGIANATO E PALAZZO which occured in Florence from May 18th till the 21st with a new selection of nearly 80 artisans. The event was held in the 16th century gardens Corsini Gardens designed by Gherardo Silvani and open to the public specially for the occasion. “Fiori d’arancio” is the theme of the 23d edition in collaboration with the Florence Convention and Visitors Bureau, Tuscany for Weddings division. The new initiative, that is proposed to wedding planners from around the world, was created to promote Florence not only as a city famous for its artistic and culinary beauty. Instead, it is also as a place where couples will find an ample selection of handmade goods created by master artisans, where they can create their wedding gift lists, personalized party favors, and find all they need to start a new life together. The brainchild of food journalist Annamaria Tossani, and among the most successful initiatives of ARTIGIANATO E PALAZZO, “Ricette di Famiglia” was held for its 4th time this year with a wedding theme. As a part of this year’s theme, at the book talk tent we will have some guests retelling their wedding stories. Every day, meetings were organized between chefs from DESINARE at Riccardo Barthel (Luisanna Messeri, Arturo Dori, Cristian Giorni, Maria Valiani) and guests during a tasting by Richard Ginori held in the Rose Garden. During these tastings the chefs proposed a new take on plates from the wedding menus of engaged visitors to the exhibition. The last session was dedicated to the winning couple of the wedding cake photo facebook competition. This couple was invited to ARTIGIANATO E PALAZZO to relive, together with the exhibition’s visitors, their special moment and taste a reproduction of their cake made by a master baker. The BLOGS AND CRAFTS initiative, with the support of Fondazione Ferragamo in collaboration with Starhotels and Source, celebrated its 4th anniversary as a unique opportunity for growth and recognition offered to young artisans under 35. The 10 talented artisans chosen to exhibit for free received coverage from 10 bloggers in the fields of artisan crafts, tourism, fashion, lifestyle, and food, as the bloggers follow the events of the show.